The Defense Advanced Research Projects Agency (DARPA) is developing a brain interface it hopes could inject images directly into the visual cortex. 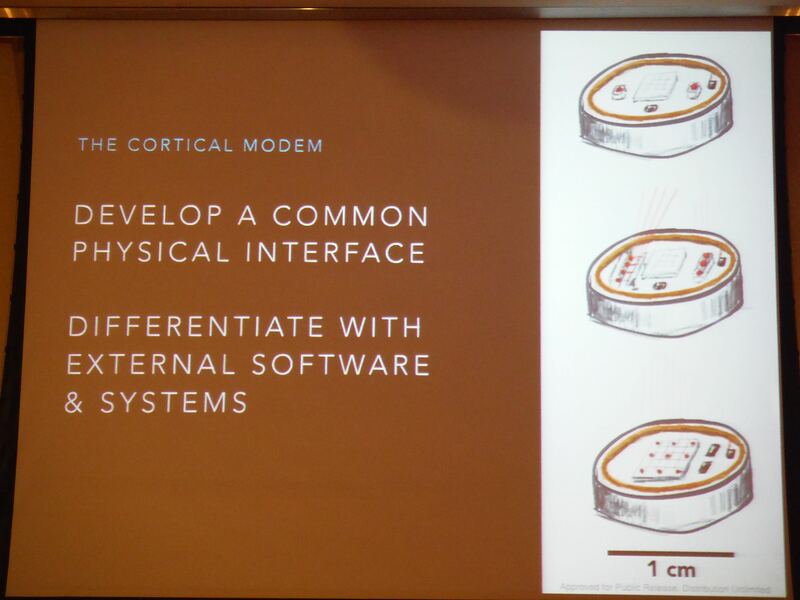 news of the “Cortical Modem” project has emerged in transhumanist magazine Humanity Plus, which reports the agency is working on a direct neural interface (DNI) chip that could be used for human enhancement and motor-function repair. Project head Dr Phillip Alvelda, Biological Technologies chief with the agency, told the Biology Is Technology conference in Silicon Valley last week the project had a short term goal of building a US$10 device the size of two stacked nickels that could deliver images without the need for glasses or similar technology. The project was built on research by Dr Karl Deisseroth whose work in the field of neuroscience describes how brain circuits create behaviour patterns. Specifically the work dealt in Deisseroth’s field of Optogenetics, where proteins from algae could be inserted into neurons to be subsequently controlled with pulses of light. “The short term goal of the project is the development of a device about the size of two stacked nickels with a cost of goods on the order of $10 which would enable a simple visual display via a direct interface to the visual cortex with the visual fidelity of something like an early LED digital clock,” the publication reported. The seemingly dreamy research was limited to animal studies, specifically the real time imaging of a zebra fish brain with some 85,000 neurons, due to the need to mess with neuron DNA and the ‘crude device’ would be a long way off high fidelity augmented reality, the site reported. DARPA’s Biological Technologies Office was formed last April to cook up crazy ideas born at the intersection of biology and physical science. Its mind-bending research fields are geared to improve soldiers’ performance, craft biological systems to bolster national security, and future the stability and well-being of humanity. The project follows DARPA’s upgrading of the heavy-set Atlas robot which was granted a battery allowing it to move about free of its electrical umbilical cord. I’ve heard about things like this before on different platforms. If it could help the blind to see then how amazing would that be?